When a cat faces a medical emergency, time is critical. It's important to get the cat to a veterinarian as soon as possible. If for some reason you can't make it to a vet's office very quickly, having a first aid kit could come in pretty handy. Having a first aid kit for your cat can also be helpful for minor emergencies. It's possible to buy your own cat first aid kit. I found this one on Amazon that seems pretty thorough as far as emergency supplies go. You can also make your own cat first aid kit if you're up to it. I've designed a complete list of supplies to add to your cat's first aid kit. Once you've collected all your first aid supplies, you'll need something to place them in. Preferably something that's waterproof and can be sealed well. A plastic box or tote is probably your best bet. Even a plastic fishing box can be used. These come in handy because they have lots of compartments to store things in and the handle makes them easy to carry around. Many of our crash kits at the vet clinics I worked in were fishing boxes or plastic tool boxes. Always keep your kit organized. Time is important in emergency situations and you can save a lot of time simply by keeping your first aid kit neat and organized. 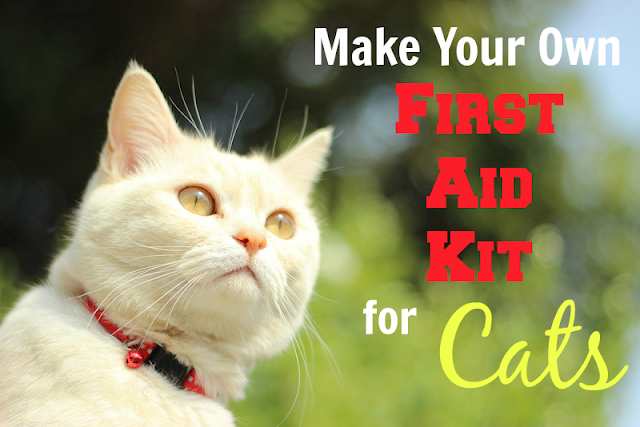 This list includes some very basic essentials for your cat's first aid kit. There may be some more items you'd like to add to fit your cat's personal needs, which is a great idea. You can also exclude anything you don't feel like you'll need. The nice thing about making your own first aid kit for your cat is that it can be personalized however you like. To go with the list of first aid supplies for cats, here's a list of common feline emergency situations. You should always seek emergency pet care as soon as you possibly can in these situations. 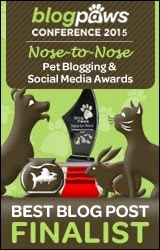 Respiratory distress and open mouth breathing - I've personally seen many cats with breathing problems decline rapidly. Seek veterinary care ASAP! Cat straining to urinate or can't pee - This is an emergency and common in male cats. Seizures - Cats can have seizures for many different reasons, so it's best to find help from a veterinarian quickly. Cat has low body temperature and lethargic - Try to warm up your cat as much as you can while you transport them to a veterinarian. Trauma - Trauma includes things like being hit by a car, attacked by a dog, broken legs, etc. Poisoning - If you think or know that your cat has ingested something toxic, call your vet to get their recommendations before trying any sort of at-home treatments. The ASPCA has a great list of plants that are toxic to animals. Cat has pale gums - If your cat is acting sick, check their gum color. The gums should be a bright pink or red color. If your cat's gums look pale or white, it's time for a quick trip to the doctor. These lists should help you be more prepared in the event of a feline emergency, although I hope you never need to use them. Special thanks to our friends at Fur Everywhere for requesting a post on this topic. 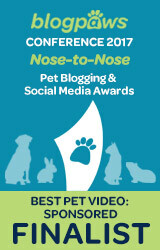 If you have a pet health related topic you'd like to see at Pawsitively Pets, just let us know! The nice thing is that the items here could mostly also apply to dogs! What a fantastic informative post. Thank you for sharing. I should be ashamed that after having pets for over 20 years I DON'T have a Pet First Aid Kit. What a great and handy reference. I need to print this! Ah Caren, don't feel bad. I'm the same way... I have most of these supplies and only recently have organized them. They are scattered around quite a bit. Thanks for a great post, it's important to have some things at home or at hand. I would add a durex too ( sounds weird LOL ) it makes a bandage on a paw waterproof for a while. shiner...manee thanx ta yur mom for puttin thiz two gether...itz nice ta have BEE FOR de emergencee wood occur ...thanx mew :)!! hay... did HD ever come home? we hope !! No guys =/ I'm afraid that if she did I would be jumping on the computer to announce it everywhere. My vet held a pet first aid workshop recently and gave us a list very similar to yours to create our own kit. I've had all those things around the house but traveling inspired me to put it all in my one place for my petsitter when we traveled recently. Great resource. Off to tweet now. Thank you Pamela. I think it's really cool your vet did that sort of thing. I have all these things around the house too, and they are kind of organized now but still not completely in one place. This is great advice! We had an emergency with our little Rascal. We had everything we needed till we made the vet by morning. He is doing fine now and still getting in trouble. Oh goodness, hope he stays out of trouble! Oh can you do a dog one for us doggy people Ann? Have marvellous Monday. Sure Molly, I'll put it on my to-do list. The dog one won't be too different! Thank you so much for this wonderful list! Going to print it off as a quick guide! Thank you! Very nice post. Now TW is worried that I have all these emergency ailments. MOL! Great idea! I wonder if I have to do that for my cats or if they could get their own together. We already have one for us dogs. 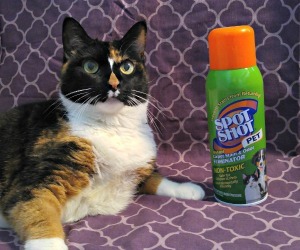 You can probably use a lot of the same items from your dog kit for you cats too. This is such a helpful post, Ann! We have a first aid kit for the cats, but we see a number of things we need to add. Thanks! Thanks guys! Glad you found it useful. Great information. I should really put a good first aid kit together for my dogs. I have a small one, but it doesn't have nearly enough supplies. Come to think of it, I should make sure it has enough supplies for me and the dogs. That is very interesting! I am keeping this post! Thanks you so much.